Captured this Snail on one of our windows yesterday. It’s amazing how, and why, they travel up the outside of buildings. Three close-ups of garden snails one of which was photographed from underneath as it climbed up the outside of one of our windows. Brian being the character from Magic Roundabout. 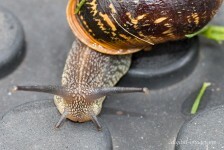 Four shots of a garden snail that my granddaughter was wanting to keep as a pet.